Sea, Sand & Sky: "Clamity" on Revere Beach, as thousands of juvenile surf clams wash ashore. "Clamity" on Revere Beach, as thousands of juvenile surf clams wash ashore. Late this summer beach lovers in Revere discovered first thousands and then tens of thousands of dead juvenile surf clams decaying on the southern portion of America's oldest public beach. By September, there were hundreds of thousands of dead clams south of the Markey Bridge, and on hot days with easterly winds, the smell of the sea was replaced by the stench of decay. "The smell was awful," said Rep. RoseLee Vincent of Revere, who Co-Chairs the Metropolitan Beaches Commission for the Legislature. Vincent contacted the Department of Conservation and Recreation, who buried the clams in trenches to mitigate the smell. However, despite their efforts, the dead clams keep coming. According to Save the Harbor/Save the Bay's spokesman Bruce Berman, there appears to be a "surfeit of surf clams" in the shallows on the southern portion of Revere Beach this year. While there are tens of thousands of dead clams washed up on the beach at the high tide line, there are tens of thousands of clams still in the sand which appear to be thriving. According to Berman, Atlantic surf clams can grow to eight inches, and are delicious in chowders, though clamming is prohibited on Revere Beach. This species of clam is particularly sensitive to water temperature and salinity, which may explain the situation. "We had a very stormy summer, with several sustained heat waves with temperature of nearly 100 degrees," said Berman. "It is likely that strong surf from north east winds pushed the quarter sized clams into the shallows, where some of them were stressed by high temperatures and fresh water from the torrential storms causing this clam kill, though there are other possible causes as well. We hope to know more about this event soon, and will continue to keep the public informed." 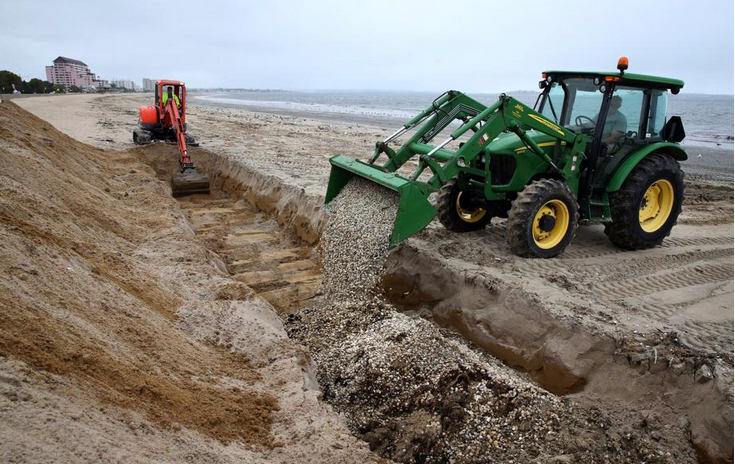 This week state scientists gathered samples of the clams for analysis, and DCR's crews returned to the beach to bury yet anther wave of dead clams. The Commonwealth's parks and environmental agencies have been very responsive, working to both understand the problem and mitigate the impacts on residents and beach goers. "This has been a great example of inter-agency cooperation and coordination," said Berman. "It is a frustrating situation for beach goers and residents, but DCR staff have been a big help." "The gulls are doing their part in the cleanup," said Berman. "I expect that the next wave of high tides will wash the remaining dead clams out to sea. Fortunately the event is confined to the southern portion of the beach, so beach goers can enjoy the last days of summer on this great public beach." According to Berman, this is not the first time that large storms have tossed clams onto Revere Beach. "During the wicked winter of 2015 we saw waves of hard shell clams of all sizes tossed onto the beach by the stormy seas," said Berman. "But they were alive and healthy when they hit the shore, though they eventually froze solid in the bitter cold." For more information about this event, or to learn more about Save the Harbor/Save the Bay and the work they do to restore, protect and share Boston Harbor, Mass Bay, the Boston Harbor Islands and the region's Metropolitan Beaches from Nahant to Nantasket, visit their website at www.savetheharbor.org or follow savetheharbor on Facebook, Twitter or Instagram. Welcoming new Policy Intern Donna! Excited to spend the fall with Save the Harbor!